Your tone in a sales pitch is absolutely critical to your success, and the message being communicated. How you say certain things has a direct impact on how well the message will be received. Think about how you communicate with prospects at all stages of the sales process. You use three different methods to get your message across, and need to understand how your tone will affect all of them. Tonality isn’t just in the words we speak, but our body language as well. Considering that you only have 7 seconds to make a good first impression, you need all the help you can get. Avoid the 5 body language mistakes that can cost you the sale. Door to door and field sales are completed almost exclusively in person at the customer’s home. With most of your presentations occurring in person, 93% of the prospect’s judgment of you will be based on non-verbal inputs, like your body language, during these face to face meetings. 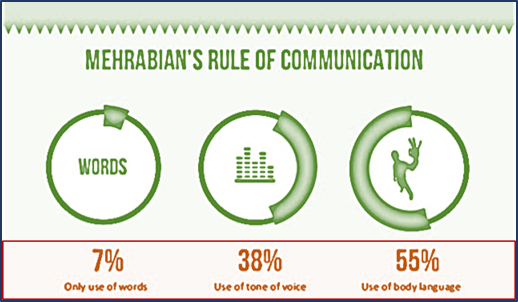 Furthermore, only 7% of the effectiveness of your communication is a result of what you actually say. This is surprisingly low considering the majority of trainings in sales are focused on what we say. 55% of the effectiveness of your communication comes from your body language, and 38% comes from the tone of voice you use in your pitch. Tonality is probably a lot more complex than you’ve ever realized up to this point. This commonality of perspective, along with fostering likability and trust, is what is at the root of real building rapport. You have to understand the three methods of communicating in order to improve the tone of each method. The rapport your build with a prospect at the door is essential to your success. Simon Sinek said, “People like to buy from people they like.” Creating this level of connection requires capturing and keeping your prospect’s attention by genuinely connecting with them. What’s more important is that they connect with you on both a conscious, and unconscious, level. Tonality is a key fundamental component of building rapport and establishing trust. The visual component of your first impression, and overall communication, relies heavily on how you present yourself, or how you dress. I bet you didn’t know the color of the shirt you’re wearing conveys a message to the homeowner. It does! And the message being conveyed has a tone to it. Find out what the color you’re wearing says to a potential customer, and the tone behind it. Your tonal patterns and body language are what allow you to establish yourself as someone worth listening to. Certain tones and gestures are pleasing to the ears and eyes. They imply certainty in regards to what you’re saying. If you’re struggling with getting people to listen to you, try locking through examples of successful sales pitches, then test a few to determine which is the most effective for you. Three Up Tones – “Hi this is Trey, with ABC, stopping by because I’m in your area” – each time when the statement is finished you raise your voice at the end. Pro Tip – Keep your prospects attention by combining tones during your presentation otherwise they will tune out. Changing your tone from high when asking a question or seeking agreement to firm when making a bold statement to going down to a whisper when you want to peak their interest will help keep whomever your talking to engaged. The “3 in 4 Rule” is a guideline to follow in order to quickly capture the consumer’s attention and gain interest. These are the three things you must do in the first four seconds of your conversation with a new prospect. The rule is designed to help canvassers and sales reps build rapport and establish credibility to make a good first impression. You need to make each of these things clear regardless of which method of communication you’re using: verbal, vocal or visual. You must come across as being “on-the ball,” and a person worth listening to. Nobody wants to listen to someone they don’t believe. If they doubt what you’re telling them, or they question it, you’re doing nothing more than wasting their time. This tells the prospect you have something great to offer. It shows that you believe in what it is that you’re offering and piques their interest to pay attention. If you’ve ever had someone come to your door to try and sell you something, you’ve more than likely encountered this situation in two ways. This tells potential customers that you are an authority figure, and a force to be reckoned with. From a young age, our society teaches us to respect and listen to people of authority. The concept authority is also one of the six principles of persuasion. Scripts allow you to maximize the key forces of tonality and body language. They’re the root of your sales pitch at the door and a guided road map for you to follow. They help you to consistently focus on the end goal of your pitch and help you understand where you want to the conversation to go. The most important reason to use a script as a guide is because it eliminated the need to think about the words that you’re going to say next. When a prospect is talking, it gives you the ability to actively listen and focus on the other forces of communication. These factors ultimately have more power to influence your prospect. While the script is your road map, it’s important to remember it can be changed. At any point you can deviate from something in the script if it’s not likely to add value to the prospect. You’re should never just be reading the script word for word. This is why understanding the goal of each section of your script is so vital to your success, and your ability to focus on the key factors of communication. One of the most challenging aspects to a sales pitch is the hook. This is a key struggle for a lot of canvassers and sales reps. Learn how to set the hook with your pitch at the door. Your script is essentially all of your best lines, used in exactly the right order. Not every sale is going to follow the exact same path, and that’s perfectly fine. When you employ a script for every part of the sales process, you have absolute certainty about what you’ll say in virtually any situation. You’re not trying to write a script for the perfect sale, your goal is to create a comprehensive script for every possible rebuttal or objection that a potential customer might have. Incorporating the proper use of tone when training your team on their sales script will help take their success to the next level. The importance of tone in sales is more complex than most realize, and highly undervalued. We’re so conditioned to focus on what we actually say, instead of how we say it and the tone we say it in. Build your script with the tone of it in mind. Teach your canvassers and sales reps why the script is written the way it is, and help them to understand the key points of inflection and tone throughout. Remember, you only have 7 seconds to make a good first impression. To do this, there’s 3 things you need to do in 4 seconds that will present the salesperson as a sharp, enthusiastic expert who prospects want to speak with.